The restaurant brings a spread of Hawaiian food — and a culture emphasizing family — to Seattle's Maple Leaf neighborhood. Some people dream about owning a restaurant. Others dream of making it big in Hollywood. Few achieve both. But such is the case for Yuji Okumoto. He and his wife, Angie Okumoto, own and run Hawaiian restaurant Kona Kitchen, which turned 15 in September, in Seattle’s Maple Leaf neighborhood. And when he’s not helping run a restaurant, he’s working as an actor and producer. A quick scan of his IMDb profile reveals acting credits in “The Karate Kid Part II,” “Inception” and “Pearl Harbor,” with more to come. Movie posters and signed actor headshots around the restaurant allude to his Hollywood ties, but the other decor — smiling family photos on the wall, art prints from Hawaii and other Hawaiian-themed paraphernalia — is perhaps the more accurate representation of what the restaurant is all about: ‘ohana, or family. His vision, he said, was to create a space where people could hang out with their families, replicating the vibe he felt when visiting Shiro’s Saimin Haven in Hawaii, where his uncle worked. Since Yuji had little restaurant experience before opening Kona Kitchen — “In my whole entire career, I think I worked in one restaurant … and I think I lasted there maybe a month,” he said — his vision might never have come to full fruition without the help of Angie and her mom, who owned a restaurant in Bremerton at the time. Yuji says he owes the restaurant’s success to their expertise. That success has come in various forms. Beyond the relaxed, family-oriented environment at Kona Kitchen, which welcomes a large contingent of regular customers, several people have even found love there. “We were talking about having a ‘wall of love’ because of how many couples have met and gotten married here,” Angie said. To take the family vibe a step further and encourage better conversation, Yuji raised the idea of a “no-phone zone” at the restaurant. “I would totally do that,” Angie said. The menu: The multi-pager is divided into Kona Breakfast (served all day), Kona Comfort (also all day), Kona Plate Lunch and Kona Dinner. Yuji says it’s a typical Hawaiian selection “where it’s a combination of different cultures that are put together on our menu, whether it’s from (Angie’s) mom, my mom, my uncle, even customers … we incorporate all kinds of different family recipes.” Hawaiian classics, such as loco moco, Kalua pig, saimin and spam musubi, are some of the offerings. 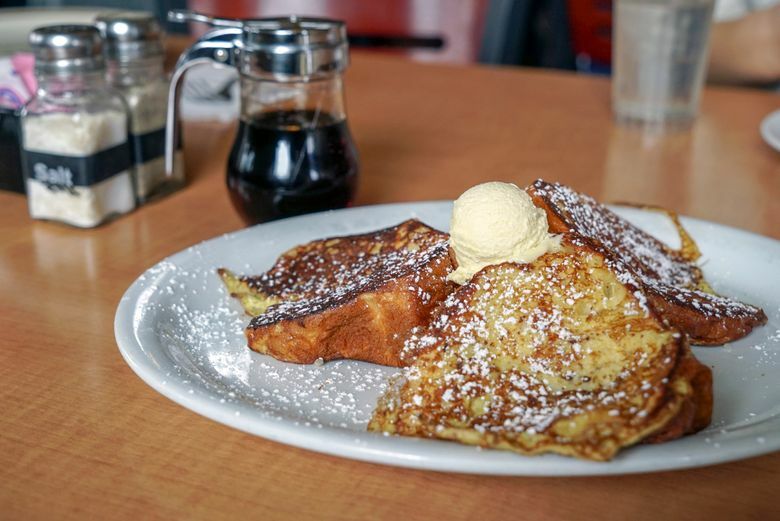 Don’t miss: The Hawaiian French toast, made with sweet Hawaiian bread, was divine. If you’ve ever had sweet Hawaiian bread, you already know we’re starting at a baseline of pretty great. Add on the ever-so-crisp egg coating, butter and a dusting of powdered sugar and you’ve got yourself an elevated specimen of toast, where each bite tastes like your softest, airiest cheat day. The fried rice loco moco, topped with a fried egg, was also excellent. 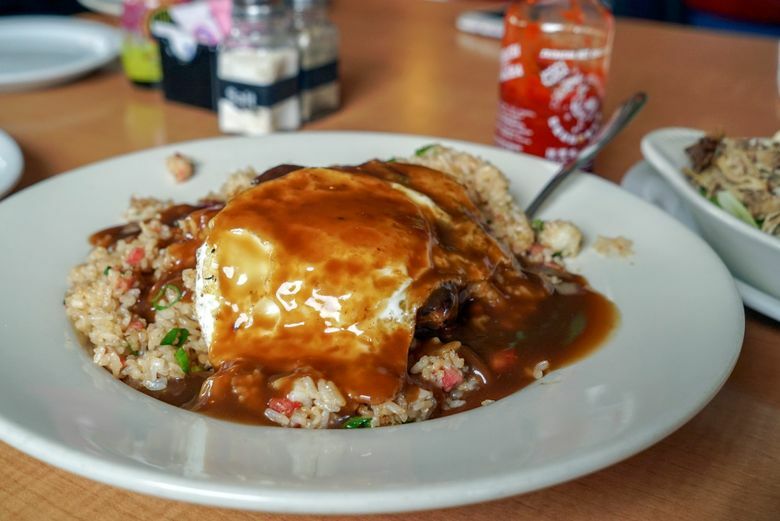 The rice was aptly sticky, and the gravy plus the runny egg yolk topped it off just right. Prices: Hawaiian French toast ($7.79), fried rice loco moco ($13.29), Hawaiian plate (17.99) amounted to $39.07 before tax and tip. This was enough for at least three full bellies.